The latest report by Right-wing think tank reform could lead to the dismantling of the welfare safety net for millions of Britons. As covered in this morning’s Times and Telegraph, Right-wing think tank Reform’s new report argues for the “abolition of middle class welfare”. But in fact this is a call for the dismantling of the welfare safety net for the vast majority of British people, challenging a political consensus that has been in place since the 1940s. The first misguided assumption here is that the very poorest can be supported by a residual benefits system. In fact, universal benefits are the best means to target the poorest (means testing reduces take up through stigma, administrative errors and systemic complexities) and, as Titmuss told us – and the Fabians have reminded us – “services for the poor will always be poor services”. As soon as middle earners are excluded from welfare, services and levels of support deteriorate. But Reform are not talking about the Daily Mail’s ‘middle classes’ (probably the top ten per cent of employees on salaries of over £45,000), or of actual ‘middle earners’ (those on around £20,000 a year). They reference the Joseph Rowntree Foundation’s research on ‘minimum income standards’ (MIS), which sets out minimum income levels that the public believe it is socially unacceptable for anyone to live below (for example, for a single person the MIS is £210.14 including rent). Reform suggest abolishing state support for anyone whose income exceeds these levels – which, as the Office for National Statistics’ 2008 Annual Survey of Hours and Earnings shows us, is pretty much everyone apart from the poorest ten per cent of employees and those who are not in work. The assumption that people in these income brackets do not need or benefit from the welfare state is ridiculous. In fact, as the ONS show, only those households in the fourth and fifth income quintiles pay more in tax than they receive in benefits (those with starting household incomes of more than £38,500 and £72,000 respectively), and groups with particular needs – including parents, disabled people and pensioners – will benefit more: there are few working families who do not need tax credits to help with household expenses. The abolition of Reform’s “middle class welfare” would in fact impose an effective tax rise on the vast majority of working people. And as well as creating large increases in poverty, reducing labour market participation and increasing gender inequalities, such massive benefit cuts would have negative implications for demand; as the US Congressional Budget Office shows, extending benefits is the most cost-effective stimulus option and withdrawal of welfare significantly reduces spending across the economy (those who need welfare benefits spend their cash). But Reform will be glad to know there are many ways in which benefits and protection for low and middle income earners can be retained without massive increases in the basic rate of income tax or negative economic impacts – by reducing tax reliefs and preventing tax avoidance among those who are the very best off, as The Missing Billions sets out. For those who are really concerned about city bankers receiving child benefit the best way to maintain provision for those who need it is simply to up the taxes of the minority who don’t. Thank you for your comment on our report. However, as one of the report’s authors I thought I should correct a couple of inaccuracies in your post. If you read the report you will see the cut off threshold we use varies among different family types. This is because a larger family requires more income than a smaller one to achieve the same level of income. The thresholds are, for example, £40,000 for a couple with two children, £20,000 for a lone parent, and £15,000 for a single person with no dependents. These thresholds are all above the median incomes for their family types (and in the cases of families with children, well above). The JFR figures that you quote are from an annex, which shows how the estimate of the cost of middle class welfare would vary with different types of thresholds. To say that they are what the figures in the report is based upon is inaccurate and misleading. Your comments would also benefit from a greater use of evidence. You cite a blog post that claims poor take-up of means-tested benefits in the UK, using old data from 2000. The more recent data from HMRC show that the take up of the Child Tax Credit, for example, is 90-95 per cent, so take up of means-tested benefits is clearly not the problem you suggest. Also, if there are problems with take-up then the solution should be to make means-testing work better (e.g., improve information and the understanding of entitlements), not to introduce expensive programmes that provide little benefit to those in need. Thanks in turn for your feedback. The post was based on the information in your press release which stated (in relation to the figures that you cite): “This is a conservative estimate. 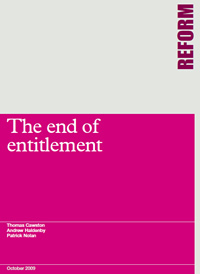 If politicians were to remove benefits for people above the minimum income level defined by the Joseph Rowntree Foundation, that would save £44 billion per year.” But the broad point remains whichever figures you use – most of the people covered by your report need the benefits they receive. I’m happy to provide further evidence on poor take up of means tested benefits – for example a recent study for the Department for Communities (http://www.communities.gov.uk/documents/communities/pdf/325108.pdf) shows that take up of Pension Credit between 2003-05 among those living in ‘high rise hardship and inner city adversity’ was 50.8 per cent. And among those who were eligible in the same group, rates of take up of income based JSA and Income Support were 71.3 per cent. In addition, earlier this year the Government’s Child Poverty Unit concluded that: “Many poor families are not taking up all of the financial support to which they are entitled. For example, in 2006-07 between 100,000 and 180,000 entitled couples with children were not claiming Housing Benefit – worth between £240 million and £530 million. There are 400,000 children living in poverty as a result of families not claiming all the benefits and tax credits to which they are entitled.”If you’re interested you can download the report from here: http://www.dcsf.gov.uk/everychildmatters/strategy/parents/childpoverty/childpoverty/. Child Poverty Action Group, with a strong history of advocating strongly for the poorest families, are against means testing. Given your interest in public spending efficiencies, you could consider the argument that universal provision, accompanied by higher taxes for those who genuinely are not in need, is a far cheaper way of achieving the goal of supporting the poorest. The cost of publicity and marketing needed to achieve high take up of every benefit we have, along with the administrative machinery necessary to facilitate it, would probably be a poor use of public money.